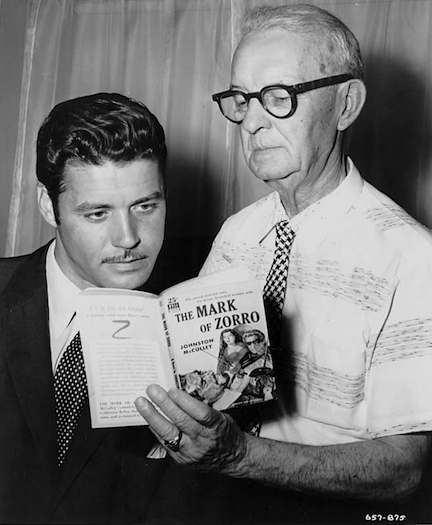 Today we celebrate the birthday of Johnston McCulley, the creator of Zorro and one of the giants of pulp fiction. Born and raised in Illinois, he began his literary career as a crime reporter for The Police Gazette. 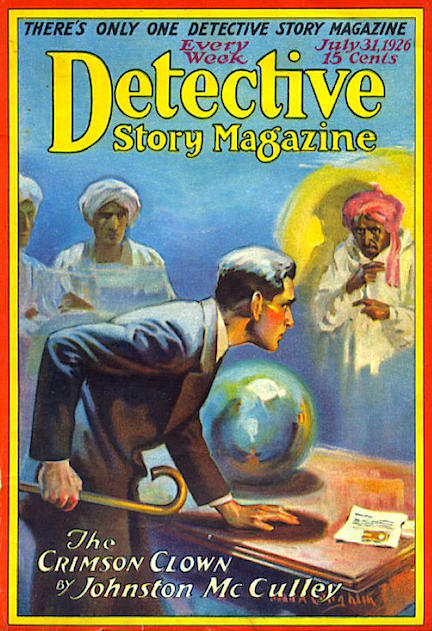 McCulley turned to fiction writing in 1906 and made his pulp-magazine debut in the June issue of The Argosy. Over the next few years he cracked other Munsey pulps—The All-Story, Railroad Man’s Magazine—sold to Blue Book, and started writing for Street & Smith with yarns in Top-Notch. In 1915, at the age of 32, he became one of the regular contributors to Street & Smith’s Detective Story Magazine, which evolved from the Nick Carter nickel weekly. The first of McCulley’s many series characters for that periodical was Black Star, a criminal mastermind who wore a cloak and a hood with a jet-black star on the forehead. These stories appeared under the pseudonym John Mack Stone, the first of many pen names McCulley used. (Others included Harrington Strong, Raley Brien, George Drayne, and Walter Pierson.) Although Black Star was a thoroughgoing villain, most of McCulley’s recurring characters in DSM were avenging angels or modern Robin Hoods—always working outside the law but committed to serving the interests of justice. Among them were The Thunderbolt, the Avenging Twins, the Man in Purple, and the unaccountably popular Crimson Clown. McCulley also score with Thubway Tham, a lisping pickpocket whose often-humorous exploits were chroncled first in DSM and later in Best Detective, a Street & Smith reprint title. To the best of my knowledge, McCulley rarely if ever employed pseudonyms for his submissions to Argosy and All-Story Weekly. 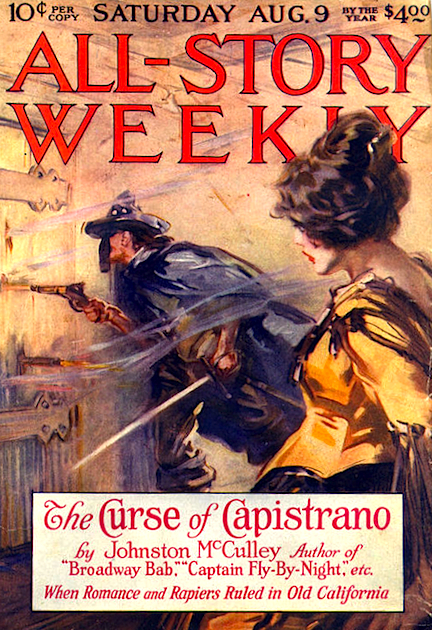 It was for the latter magazine that he created his most famous pulp hero, Senor Zorro, who first appeared in “The Curse of Capistrano,” a book-length novel serialized in five parts during the summer of 1919. The basic idea, involving a daring hero who poses as a foppish aristocrat, had already been used by Baroness Orczy in The Scarlet Pimpernel (1905), but where her story unfolded in Europe during the French Revolution McCulley set his in Old California during the late 18th century. The Fox film, which starred Tyrone Power, Linda Darnell and Basil Rathbone, made Johnston McCulley hot again and he was able to sell one last novel, “The Sign of Zorro,” to Argosy for serialization during 1941, as The Mark of Zorro was playing in the nation’s movie theaters. In 1944 he parlayed the character’s continuing popularity into a series of short stories for the Thrilling Group’s West, which had become a mundane pulp magazine. The Zorro series ran in West for seven years, and during that time McCulley revived his Detective Story Magazine characters Thubway Tham and The Crimson Clown for Thrilling’s detective pulps. West lasted only a couple more years after dropping the Zorro series in 1951. Pulp magazines were dying, and after nearly a half-century of fictioneering Johnston McCulley was pretty well written out. He made sporadic short-story sales over the next few years but might easily have been forgotten but for Walt Disney’s 1957 licensing of Zorro for a TV series broadcast over the ABC network. Zorro was a huge hit that lasted for three seasons and continued to earn good ratings for years afterward in syndication. McCulley died in 1958, having lived long enough to see his most famous creation revived for a new generation. I suspect he’d be amazed to learn that, another 50 or so years later, Zorro is still going strong in movies and on television. On the basis of volume alone Johnston McCulley could be considered a hack. A fair percentage of his output was bland, trite, and/or repetitive. His various Detective Story series abound with familiar situations and character types, and like most high-volume producers who were active for a prolonged period, his later yarns cannibalized earlier ones. But like other pulp writers who enjoyed comparable longevity, McCulley was a natural storyteller whose stories, whatever their flaws, were never unreadable. He never lost sight of the quality that endeared him to editors: his ability to provide the masses with escapist entertainment. Altus Press and Wildside Press, to name just two specialty publishing houses, have reprinted some of his works. I recommend giving them a try. McCulley shows Guy Williams a copy of his most famous story. Nice writeup ED. He’s always been a favorite of mine. Great article. I’ve always been a huge Zorro fan. And have my copy of Mark of Zorro on my keeper shelf.